University of Chicago is a fairly selective business school with an acceptance rate of 22%. Similar to Kellogg, Booth has one of the higher acceptance rates for a top 10 school. While building an MBA admission calculator, I uncovered some insights on how Booth evaluates MBA applicants. 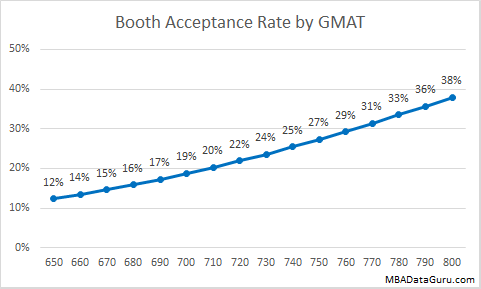 The graph above demonstrates that GMAT has a high impact on Booth admissions. Increasing your GMAT from 650 to 750 more than doubles your chance of admission. The average GMAT score for an applicant is 718, but the admitted applicants have a slightly higher GMAT of 724. 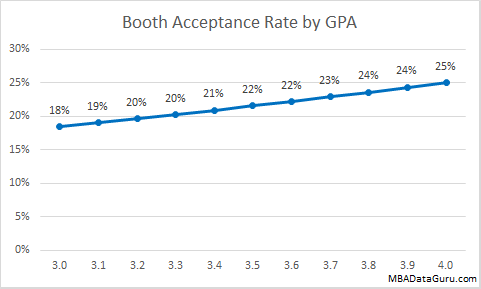 A high GPA will give you a slightly higher acceptance rate at University of Chicago, but it is easy to see that GPA doesn’t have a very large impact on admission rate. Even with a 3.0 GPA the Booth acceptance rate is 18% which is higher than the acceptance rate at Harvard for an applicant with a 4.0. 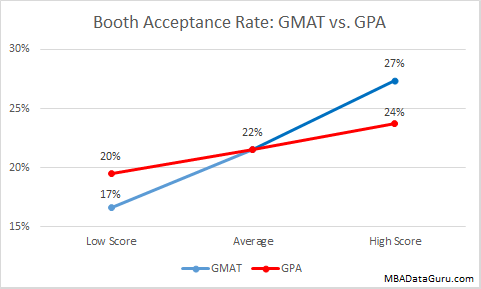 The graph above compares the importance of GMAT vs. GPA to Booth admissions. Candidates with a high GMAT score had a significantly higher acceptance rate than those who had a high GPA. * If you have a high GMAT and a low GPA, University of Chicago is an ideal school at which to apply. For example an applicant with 3.0 GPA and a 760 GMAT has a 25% chance of being admitted. Similar to Duke and Cornell, the Booth admission committee prefers applicants who are around 27. 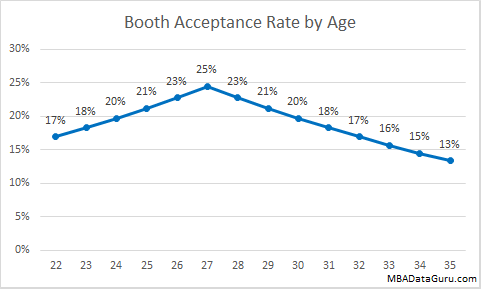 The further a candidate is from the average age, the lower their chance of acceptance is. I believe that this is because candidates with around 5 years of work experience have worked long enough to impress potential employers and contribute to classroom discussion while not being over qualified for on campus recruiting positions. Which round you apply in does actually affect your chance of admission at University of Chicago. 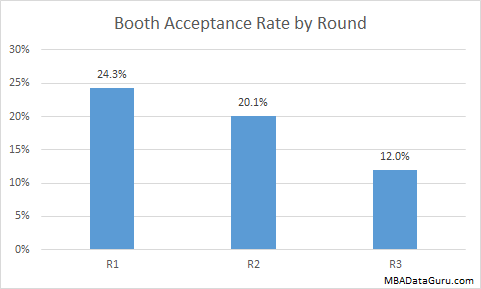 There is a small drop off in acceptance rate between round 1 and 2, but then a large drop in round 3. Applicants who are living in India have only a 7% chance of being accepted at Booth. Science and Math majors have a slightly higher chance of admission. Liberal Arts and Humanities majors have an exceptionally high chance of being accepted, at 56%, while Engineering majors have lower odds at 17%. I think that it is not that Booth is specifically trying to attract Liberal Arts majors, but that they are trying to bring in more women, who happen to be more likely to major in Liberal Arts. Finally investment bankers have only a 14% acceptance rate at Booth. *A high GMAT or high GPA is defined as one standard deviation above average. This entry was posted in Admissions, Booth, GMAT, GPA, MBA and tagged Admissions, Age, GMAT, GPA, Industry, Major, MBA, Work Experience on December 23, 2014 by Data Guru. 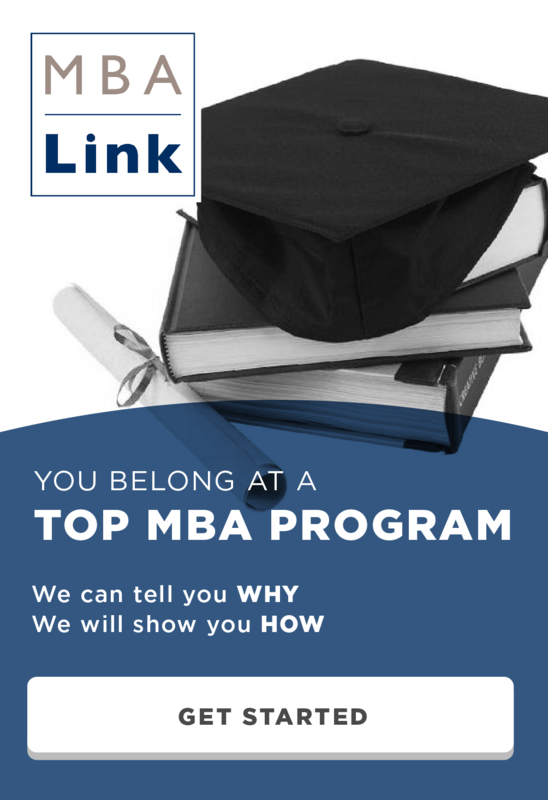 MBA Data Guru, where are you getting your data for age of applicants? The age comes from GMAT Club. If age is missing then I estimate based on factors such as years of work experience. I think something may be wrong with the rate provided for Booth. I entered a fairly low 640 GMAT and a 3.50 GPA and Booth is showing a 37% acceptance rate. How can that be? My guess is that you were a liberal arts major which has a high acceptance rate. It may be that women who majored in liberal arts have a high acceptance rate while men don’t get the same benefit. Unfortunately I don’t have the data to tell if that is the reason.